6 Troop Carrying LCAs, then 5, then 4. Leonard Albert King was just 20 years old when he piloted his flat bottomed Landing Craft Assault (LCA) to the Normandy beaches, early on D-Day morning. Although he was amongst the first to land on the heavily defended beaches, his account belies the extremely hazardous position of his craft. This account is based upon the diary he maintained for several weeks around this time. LCAs were not designed to travel long distances in open seas. Accordingly, they were usually carried to the landing beaches on mother ships, not unlike modern lifeboats, suspended from davits. Len's mother ship was the SS Princess Maud, which, pre war, had been a railway ferry that plied the waters between Stranraer, in south west Scotland, and Larne in Northern Ireland. She had been requisitioned for war service and converted to a troop carrier with additional capacity to carry 6 LCAs, each with a capacity about 35fully armed troops. These early designed LCAs were constructed of wood, with some armour plating for protection against rifle and machine gun fire. They were powered by two Ford V8 engines driving twin screws to produce a cruising speed of 7 knots. Her crew of four comprised a coxswain, mechanic, gunner and sheets man (?). On the night of 5 June, 1944, after a delay of 24 hours due to bad weather, we set off for Omaha beach near the town of Vierville as part of 519 LCA Flotilla. We were escorted by destroyers, cruisers and other battle ships as part of the American 'Western Task Force' invading Utah & Omaha beaches, while the British and Canadian 'Eastern Task Force' invaded Gold, Juno & Sword. SS Princess Maud carried several hundred Yankee soldiers, mainly demolition men to clear beach obstacles in advance of the initial assault troops. 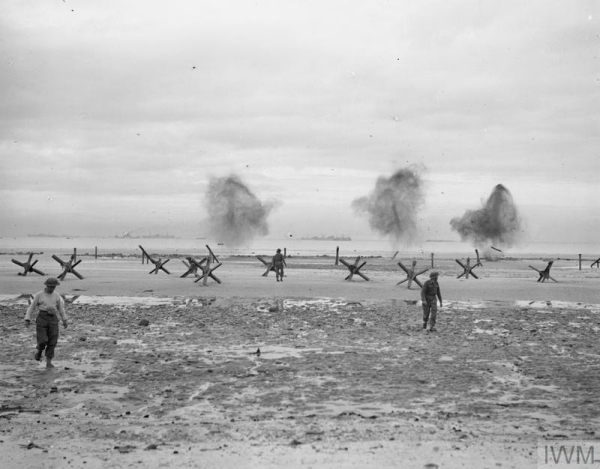 The obstacles were designed to hinder the progress of the invading forces as they approached and crossed the landing beaches. The obstacles included ramps, hedgehogs, stakes and element C. These brave men had their own specialised 'Landing Craft Mechanised' (LCMs) to transport them to the beaches, where they would face enemy machine gun fire and mortar bombs, while they went about their work. Our job was to pick up American troops from other troop carriers and transport them to predetermined positions on the landing beaches. The crossing of the English Channel was rough and we hoped it would settle before we beached our small vulnerable craft. 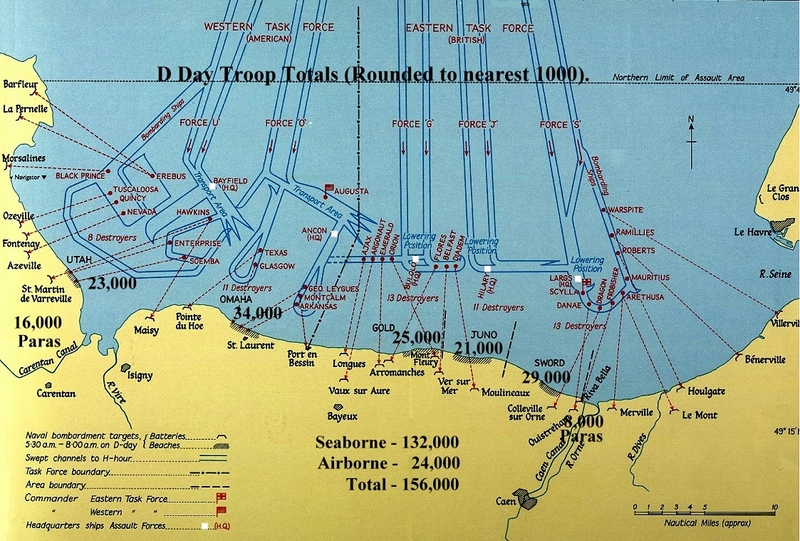 As we neared France, Allied bombers, with fighter escorts, dropped bombs to soften up the landing beaches in advance of the initial assault force. We could see enemy ack ack fire in response. Unbeknown to us at the time, a few thousand paratroopers had already been dropped behind enemy lines. We reached our rendezvous point about 03.00 hours on June 6th. American troops of the 1st battalion, 116th US Infantry loaded into LCMs secured alongside. At about 0400 hrs, we manned our craft and were lowered into the rough waters. Manoeuvring our flat bottomed craft was difficult with 3 foot waves and a heavy swell. Water sprayed over our boat as we headed for the Empire Javalon, a nearby LCA/troop carrier. We were hoisted up to embark men of the US 5th Ranger Battalion. Once fully loaded with our complement of troops, we were lowered into the water. On return to the vicinity of our own ship, SS Princess Maud, the LCMs were still loading the demolition teams. Their craft were tossed up and down like corks, banging against the ship's side with securing lines parting and being replaced. The men looked precarious, as they climbed down scaling ladders with their heavy gear on their backs. The difference between the British and American embarking procedures was dramatic in these rough conditions. However, the British procedures were not without their own problems. One of our craft, by then fully loaded with troops, was floundering and in danger of sinking. Although not apparent until the craft was back in the water, she had been holed during hoisting aboard the Empire Javalon. Her crew refused to hoist her back! Fortunately, the coxswain remained calm and circled Princess Maud until everyone, troops and crew, disembarked. Shortly after, the LCA nose-dived beneath the waves. As daybreak broke, we could see the awe-inspiring sight of thousands of ships and craft preparing to transport the troops and their equipment to the landing beaches. The battleships, cruisers and rocket craft bombarded the coast to further soften up the enemy defences. The time came for our remaining 5 craft to make for our designated landing beaches. At first we made good progress but our Flotilla Officer’s (FO's) craft took on water and started to go down by the bows. In an attempt to steady the craft and reduce water ingress, the coxswain manoeuvred the craft to put its stern to the weather but the unstable LCA capsized. The Flotilla Officer (FO), crew and most of the soldiers were picked up by the remaining 4 boats and we proceeded towards the beach. As we drew closer, the more hazardous became our position from shells, mortars and machine gun fire. Many craft around us succumbed to the deadly fire, some capsizing. There were many casualties but we had to focus on our mission. Our 4 remaining craft successfully disembarked our troops and succeeded in un-beaching; but not without damage. One of our boats was riddled with bullet holes, with a 4 inch shell embedded in a battery, which put the port engine out of action. Some craft from our flotilla were picked up by the Prince Charles, an LCA/troop carrier, which happened to be quite close to the beach attempting to rescue some of her own badly damaged LCAs. Another of our LCAs was picked up by Princess Maud, as the crew baled out as though their lives depended upon their labours. Our fourth craft, Nobby’s, was picked up by yet another ship. We met up with Nobby that evening in Cowes on the Isle of Wight. The bow of his craft was badly mangled and in the relative safety of home waters, we found it difficult to accept the reality of the noise, violence, death and destruction of total war we had witnessed. We had a rough time but we survived. Others performing similar duties, were not so lucky. One of our lads, 'Shorty' Griffin, was reported missing but later found to be in Hospital having been plucked from the sea by an LCT. There was little time for rest and recuperation. 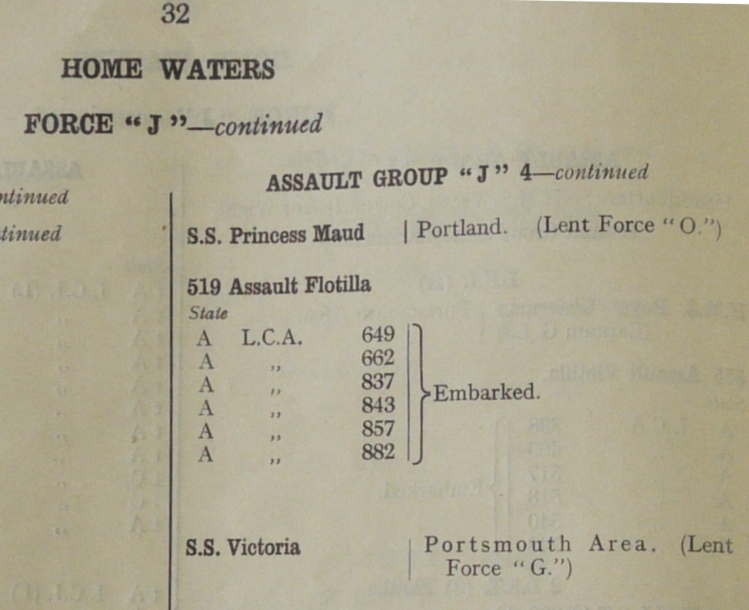 Next day, 4 new LCAs were delivered, replacing those lost or damaged and we sailed round to Portland for more troops. Our second trip to Normandy was on June 10th, when we carried military police (MPs), doctors and medical orderlies to Utah, the second American beach. It was less hazardous this time, since the enemy beach defences had been cleared, although we were still vulnerable to mines, shells and strafing by the Luftwaffe. We arrived about 0400 hrs as landing craft of many types unloaded stores, munitions and supplies. We landed on an ebbing tide, so quickly disembarked our human cargos to avoid being stranded high and dry. Despite our best efforts, 2 of our craft were stranded until the next tide. On D-Day, these craft would have been picked off like sitting ducks by shell fire and mortar bombs. However, on this trip, it was more of an inconvenience, as vital landing space was unnecessarily taken up on the busy beachhead. Mine clearing work was still in progress off the beaches and one mine was detonated fairly close to our position. We were hoisted back on board our mother craft and spent the night just offshore. An LCT came alongside loaded with British Troops of the Pioneer Corp, who had previously had a wet landing when their craft stuck on a sand bar a few meters from the shore. At dawn, we took them to their landing beach, this time giving them a dry landing! Amongst their number were 2 stretcher cases and a soldier with a broken arm. We carried them back to England for hospital treatment. Back at Portland, we embarked another 850 men of US Army on to our mother ship and safely delivered them to France on June the 13th. It was an uneventful round trip although, on the return leg, we zig-zagged to avoid a reported U-boat. With 3 days ashore, we went on the razzle and to the dances! The 2 stranded LCAs returned safely. At 0200 on June the 18th, we departed with more American troops, landing them without incident in France at about 11.00 hrs, this time directly on to a pontoon pier. Next morning we joined a homeward convoy, during which we saw minesweepers in action clearing mines laid by the Germans during the hours of darkness. Two were detonated in the middle distance. After visiting Netley on the approaches to Southampton, to store up and refuel, we proceeded to Cowes for a welcome spell of shore leave. We then transported British troops from the North and South Staffs and the Royal Norfolks of Monty’s 2nd Army. We passed by the protruding bows of two sunken Liberty Ships; a reminder that easy passage across the channel could not be taken for granted. We disembarked at noon on June the 28th, men and bicycles. On our convoy home, another LCA/troop carrier, the Maid of Orleans, was sunk by a mine. Five men in the engine room were killed but the remaining crew were picked up by destroyers. We docked at Cowes and later embarked a Leicester Regiment and 6 patrol dogs at Southampton. The weather was pretty rough but we successfully landed our troops, returned to Southampton, embarked American infantry, electricians and 20 nurses; the first women to come aboard and landed them all on the beaches, since the pontoons we had been using were high and dry. Some craft became stuck on the sand but we returned to our mother craft, sailed home to Cowes and enjoyed some shore leave. On 12 July, we picked up 450 British troops, our official carrying capacity, as opposed to the 800 or more on previous trips. We landed them on 14 July in comparative peace, needing only 3 return trips for each craft. Len's diary ended at this point, most likely because the trips to France had become much safer and routine. The use of LCAs continued until larger ships could safely use functioning ports captured from the Germans. In Nov 1944, Acting Temporary Leading Seaman, Leonard King, service no C/JX 379424, was awarded a DSM (Distinguished Service Medal) for an action during Operation Infatuate, the assault on the heavily defended island of Walcheren in the Scheldt estuary. While the island remained in enemy hands, the Allies were unable to use the port of Antwerp which had fallen to them. It was of great strategic importance in the supply chain to the Allied armies, by then advancing towards Germany. 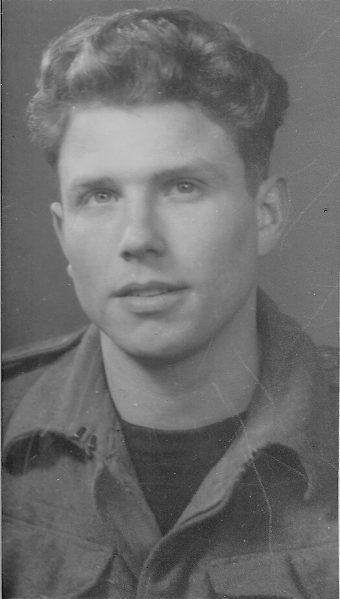 We're very grateful to Ray King for sight of his brother's diary on which this webpage is based. 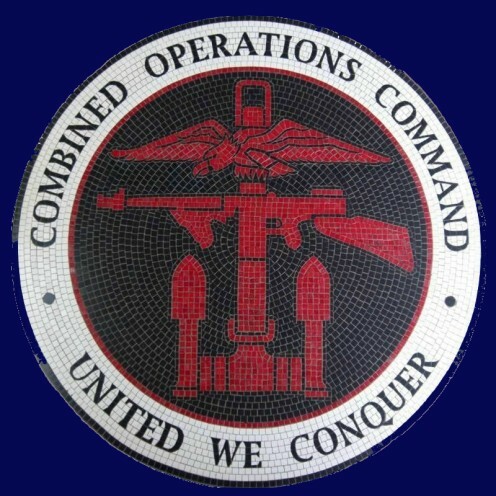 The text was approved by Ray before the webpage was published. Photos and maps have subsequently been added.